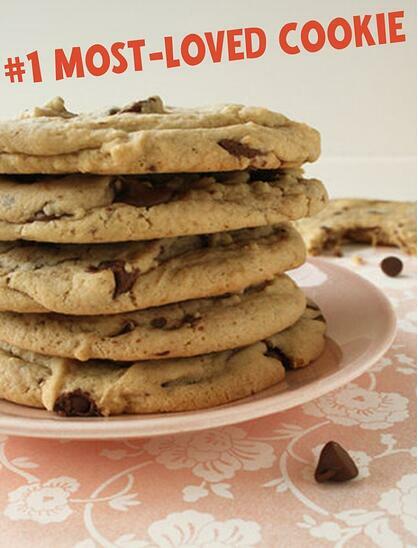 It’s National Cookie Month! How well do you know your cookies? 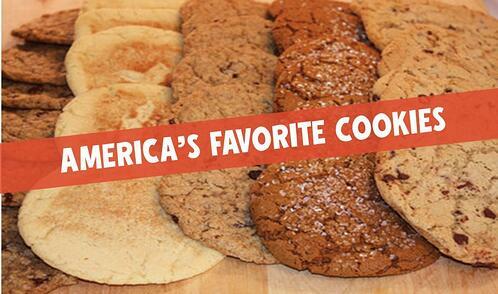 If the cookie concept is an import, the chocolate-chip cookie is an all-American invention. Twice-over, since it features an ingredient indigenous to the Americas: chocolate.4 Created in Massachusetts during the Great Depression by Ruth Wakefield, the story of the chocolate chip cookie has been fairly well-covered in popular culture (such as this article in the New Yorker). Across the decades and through infinite iterations, the chocolate chip cookie remains – hands down – the most beloved cookie in the country. The chocolate chip cookie is more quintessentially American than apple pie. Even in the earliest days of Great Harvest, before we had café menus and a full line of sandwiches and goodies, one of the staple menu items was chocolate chip cookies. 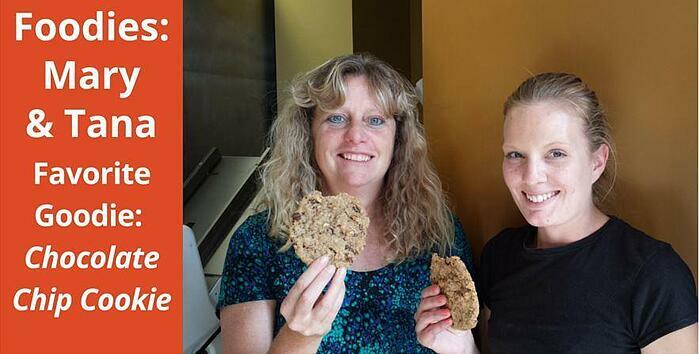 Actually, the very first cookie sold by founders Pete and Laura Wakeman was Oatmeal Raisin. They adapted it from a family cookbook curated by Pete's mom. Starting with that family favorite, they switched the flour from white to whole wheat and experimented until they had a cookie they liked. But customers kept asking for a chocolate chip version, so before long they developed a recipe for that, too. Sold alongside Great Harvest’s Cinnamon Rolls and loaves of Honey Whole Wheat, the first Great Harvest Chocolate Chip Cookies featured real chocolate and 100% pure ingredients like whole wheat flour, old-fashioned Quaker Oats, brown sugar, eggs, baking soda, baking powder and salt. Over 35 years later, we bake many more types of cookies, but still retain the same commitment to real food ingredients. America’s favorite cookie flavors may be the most common, but there is no shortage of originality where cookies are concerned. Textures run the gamut from cakey on one hand to crisp on the other. If your personal favorite isn’t among the top six national flavors, you aren’t alone; Mintel tracks over 75 other top choice flavors. Today, cookies may include unique spice combinations that blend sweet and heat, or unexpected ingredients like meat. They may even be entirely savory, pushing the boundaries of our perception of the cookie category. What If You Want a Cookie, But Also Care About Nutrition? While cookies are an indulgence, there are healthier options to be found. Here at Great Harvest, most cookies are made from our freshly ground 100% whole wheat flour, though some are made with enriched white flour or a blend of whole wheat and enriched white flour (refer to our nutrition information (pdf), or ask your local bakery for additional specifics). For home baking, it is fairly easy to find healthier-for-you options that satisfy your sweet tooth without wrecking your health. Fitfluential has rounded up 31 days worth of recipes for delicious “better for you” treats, made with wholesome ingredients, here. Whatever dietary restrictions you may have, there is truly a cookie for everyone. Why Apple Spice? Fall is such a gorgeous time of year — the colors, the sound of crunching leaves, the brisk morning air — throw in the taste of an Apple Spice Muffin and your perfect fall day is complete. 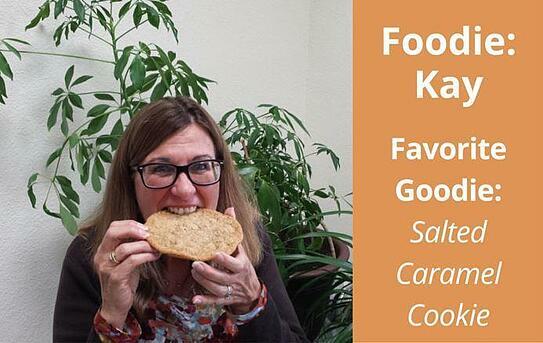 Why Kay loves the salted caramel cookie: "A soft buttery cookie with the perfect blend of sweet and salty. It tastes great with coffee. There's nothing better!" Amanda on her favorite : "I love my dog and she deserves real food too!" What’s Baking at Your Local Great Harvest? *Visit your local bakery for their baking schedule and menu. Share your favorite current (or future) Great Harvest cookie flavor in the comments. Visit your local Great Harvest to celebrate National Cookie Month with us! Don’t live near a Great Harvest? 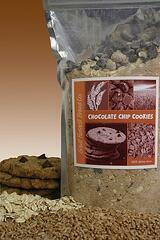 Contact one of these bakeries to order our chocolate chip cookie mix by mail. 1. 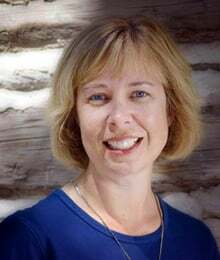 Aine Cain of History.org, accessed here. 3. Linda Stradley of What’s Cooking America, citing the 1796 cookbook “American Cookery: or, The Art of Dressing Viands, Fish, Poultry and Vegetables, and the Best Modes of Making Puff-pastes, Pies, Tarts, Puddings, Custards and Preserves, and all kinds of Cakes, from the Imperial Plumb to plain Cake,” by Amelia Simmons, accessed here. 4. Rodney Snyder, History of Chocolate: Chocolate in the American Colonies, accessed here.